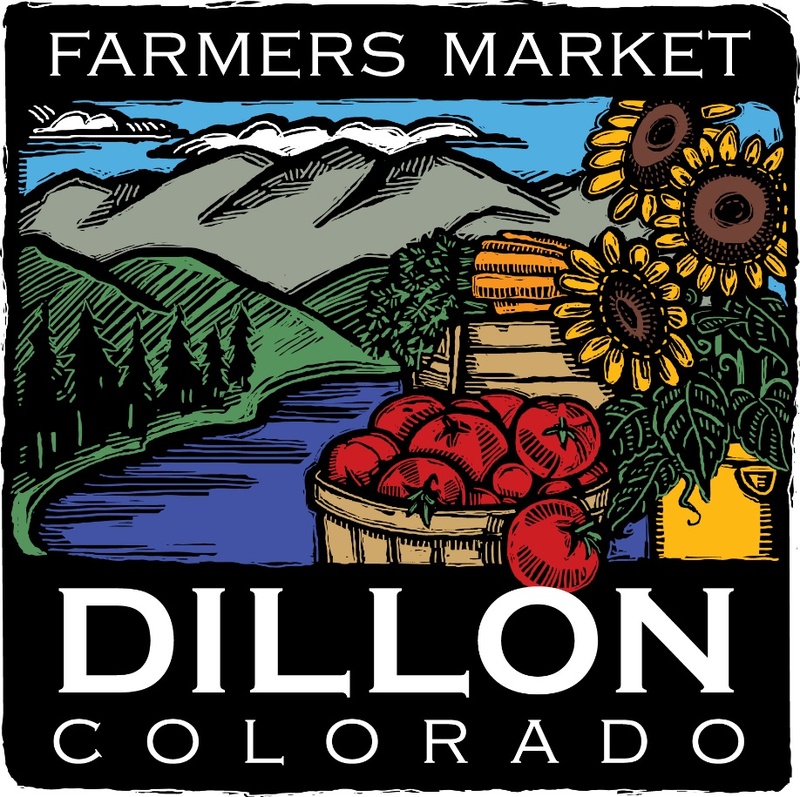 Yesterday I had a fun time going to the Dillion Farmer’s Market here in Colorado where it was a cool and sunny 66 degrees. The only drawback was that my daughter wasn’t here to come with me. The two of us typically go to all the farmer’s markets in the area, sampling the various foods and goods from the numerous vendors all over the state of Colorado. Since she’s attending summer school this summer she couldn’t join me. So to make the trip more entertaining I decided to bring my camera and take some photos of those food vendors that I liked best. There were booths with a large assortment of food, from jams to smoked salmon, jewelry, clothing, silver platters, homemade soaps and the list goes on. However, since I write a food blog, that’s where my focus was. Although all the vendors had wonderful items to share these were some of my favorites. Award winning handmade artisan farmstead goat cheeses that are incredibly smooth and mellow tasting. Each one with it’s own unique flavor that you don’t want to miss. 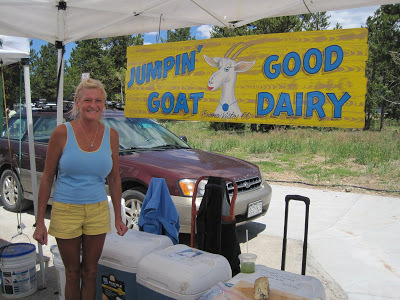 With over 360 goats that roam freely on over 46 acres in the Bueno Vista Mountains of Colorado, Jumpin Good Goat Dairy knows exactly what’s it’s doing when it comes to making the best goat cheese. Check out their catalog to view all their goat cheese varieties. All I can say is WOW! If you love goat cheese you’ll adore Jumpin Good Goat Dairy cheeses! 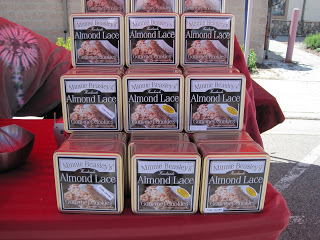 Next up was Minnie Beasley’s Handmade Almond Lace Cookies. Oh my heavens, these were so buttery and light. I could have eaten the entire tin but, of course I had to share it with my family, and better that I did, otherwise my waistline would not be happy. Minnie Beasley’s Almond Lace Cookies come in two flavors, Almond Lace and Double Chocolate and even Gluten Free! These tasted so sensational that now I want to learn to make them. Of course, I’m sure I won’t get close to their recipe. Plus, when all you need to do is order these perfect little lace treats in either a tin or a bag online, why bother trying to create your own. Don’t forget to check out their specials! This is Bonnie & Carole of Grammys Jam. These two ladies were so nice and had some delightful homemade jams and marmalades. Of course, you remember I just blogged about making jam in my previous post. Since I’ve never attempted canning before, they handed me a beginners guide to canning and recipe booklet, to get me going. I can’t wait to try it! Plus, through the Ball Corporation, you can even purchase a canning kit along with tips for Fresh Preserving. Check out this video on canning, it looks so simple. I’m definitely going to order this kit. I love learning and mastering new kitchen techniques! When I do, I’ll be certain to share them with you. Before I left Bonnie and Carole’s booth I purchased a jar of their Strawberry Banana Jam just for my hubby. You know how he loves Strawberry Jam. 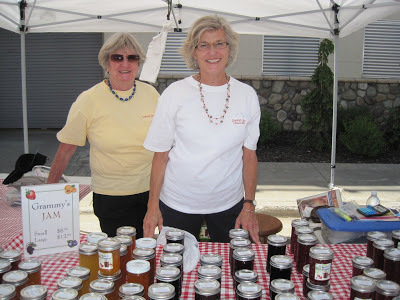 Bonnie and Carole don’t have a website yet, but you can contact them at their Minturn, Colorado location @ 970.827.5684 to get a list of all their homemade jams and marmalade’s. 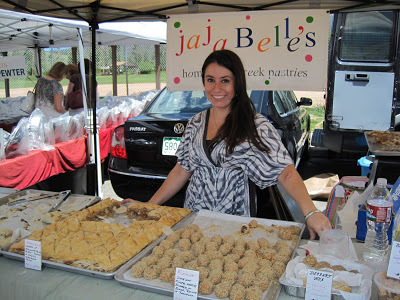 This is Jessica of jajaBelle’s Homemade Greek Pastries. Jessica was very eager to share with me the greek pastries her grandma YiaYia taught her to make. I sampled Baklava (layers of walnuts, phyllo, butter and covered with grandma YiaYia’s homemade syrup). Although I just tasted small bites of each of these, they were fantastic and not too sweet – just right. In fact, Goldilocks would have loved them all just as I did. Click here to learn more about jajaBelle’s. 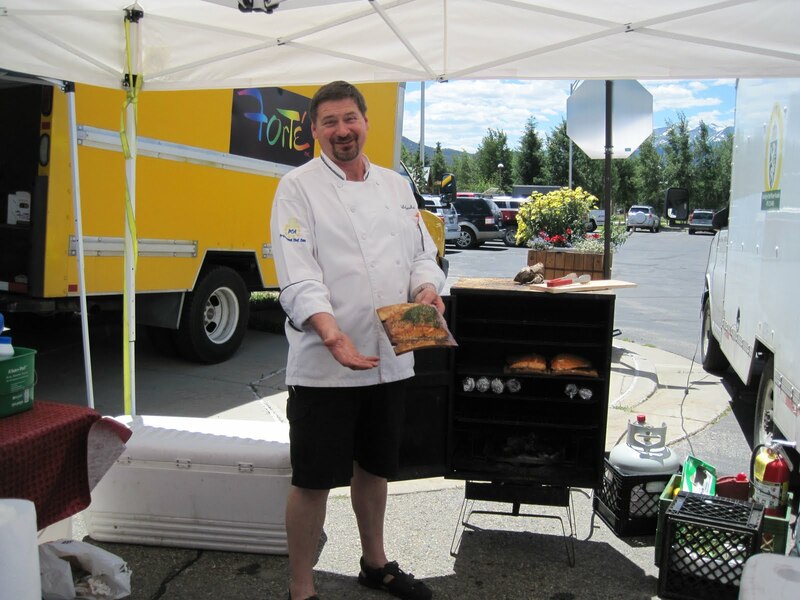 My final stop was at Chef Neuhold’s booth. He makes smoked fish in addition to dips and soups. I tried a sample of the Smoked Salmon that was delightful. I grew up eating smoked salmon but what I loved about his, is the fact that it’s not too salty or too smoky. I could eat this alone, in a salad, on a bagel with cream cheese, in pasta or whatever else you can think of. Check here for a list of products he makes and recipes! In spite of the fact that my daughter wasn’t with me I had a very enjoyable day. Spending the time like I did, talking with the vendors and learning about what they do, made it a far different experience than I’d had before. As I mentioned, there were many more vendors at the Dillion Farmer’s Market each having unique and wonderful items to sell. Yet these “foodie booths” were the ones that captured my attention most. Please check out their websites or give them a call. It’s always nice to support the local vendors in the area or wherever you may live. Which farmer’s market is your favorite to go to and why? Maybe next time we’re in that area we can check it out. To find a Farmer’s Market near you, click here. If you click on the link at the bottom of this post you should be able to find a farmers market in your area. I think they’re all fun to go to. Each one is a little different. Sounds like a wonderful market with such a great variety! Interesting that you would mention canning. I am taking a canning class at my grocery store next week. It is one of the many things I regret not learning from my grandmother. I am going to check out that canning kit! Thanks for sharing your trip to the market! They gave me this great little booklet but then when I watched that video I couldn’t believe how easy it looked. I haven’t ordered the kit yet but plan to just as soon as we return from vacation. I can’t wait to try it. I have a pasta sauce that I haven’t made in years because it makes such an enormous batch but it’s so incredibly delicious. Now I’ll be able to make it and can it. Please let me know how the canning class goes. I wish I could take it with you. It has been awhile, but just want to return let you know how the canning class went. It was interesting, and informative. Most of the info they gave me is available on the internet. The scary thing is that there is no way to tell if something has been canned properly. They also said to be sure your recipes have the correct pH. You have to be especially careful with things like salsa and only use a recipe that is for canning and not change the proportions because that can change the pH. Overall, it was a good glass. Not sure if I am ready to invest in a pressure canner, but I think I could handle the water bath. @dulce dough – that surprises me that you can’t tell if something has been canned properly. However, most of them are done with fresh fruit which typically doesn’t need any refrigeration but proper storage would be important. Of course that doesn’t help if you are canning any type of meat product. Did you look at the site I referred to? I wonder if they would have a better answer for you. You’d think by using a thermometer that it would help. I’ll have to check that out. Thanks for sharing. I love a good farmer’s market Vicki, and this one looks great. Thanks for the tour. Sadly I’ve only ever been to Denver’s airport (which is quite lovely for sure…we have a mall in Toronto by the same Architect! ).